Productivity as a Measure of Worth? I seem to be forever stuck with this feeling that if I don't have something to show for a day that I have lived that my value as a human being is slipping into a sort of negative zone. But, many days I am disinclined toward work and would rather just read or nap. While logically I believe it is fine to do just that, we have all been programmed to be productive and that programming tarnishes the joy of just being. Woke up with a headache, but have put gone to that with a couple of Ibuprofen. Still a long soak in the tub is on my schedule. Rain is now appearing regularly after the long drought, but it is too wet to cut the greens though they sorely need it. There was another hailstorm that damaged our car and really did a number in the nearby town. That makes 3 this summer, unusual. Have enjoyed some fall- like temps but Saturday and going forward moving back to the 90's. At least we will get in a bit more pool time. Am sorely agitated about the therapist appointment tomorrow, if for no other reason than that I haven't driven to the city in a few years, but it's not far and I feel the simple act of getting there on my own is important and a victory in its own right. Tomorrow evening daughters and I are going to hear a local band to celebrate daughter no. 2's - 52nd birthday. Must make sure my earplugs are in my purse. As for productivity, yesterday I pulled the last of the beets and started to mosaic the sidewalk cracks. I'm really liking the way it is looking though only able to work in short bursts, can't sit on sidewalk, can't bend over for long. Garden seat broke, ordering new one today. I've already tidied the house, cleaned the cat box, and washed some dishes. That may be it for production today though I'll most likely throw together a meal later. For the moment I'm going to rummage around in the fridge and look for fun leftovers before I fall into worthlessness. I am chuckling in unison bro. You do make me laugh, no easy accomplishment. Gotta say: I do think productivity is important. It's the difference between being an agent or being an object. But we all get to define what we want to produce. Good thoughts, now I simply have to alter my perspective/definition of productivity. Just producing carbon dioxide on my exhalations could be sufficient for the moment. Love the idea of sidewalk crack mosaics!! You have created beauty where there was brokenness - you have gone beyond worthy! What a beautiful way to look at those cracks, love it, love you! I tend to measure my worth by productivity many times too...I don't think we should though. Having days just to "be" are important too. I hope your therapy session is insightful and uplifting. What a beautiful picture of you and your daughter! I hope her birthday is special! The mosaics in the cracks in your sidewalk are pretty. So creative! It is so nice that you understand. I am hopeful that the therapy will be a new start for me, need a boost. Thanks for the compliment, not only is she lovely, she is very kind too. Waiting for cooler weather to add more to the mosaic, lots of cracks out there. Thank you. I don't know that I would like all that snow though we do get some where I live. i love your sidewalk mosaic. for projects like that, i usually lie on my dog's bed. he's a big dog. Thanks, and I have a big dog too, what a great idea to use her bed! I am sure going to try that. I've always been used to being much busier I guess, learning how to relax is a challenge. 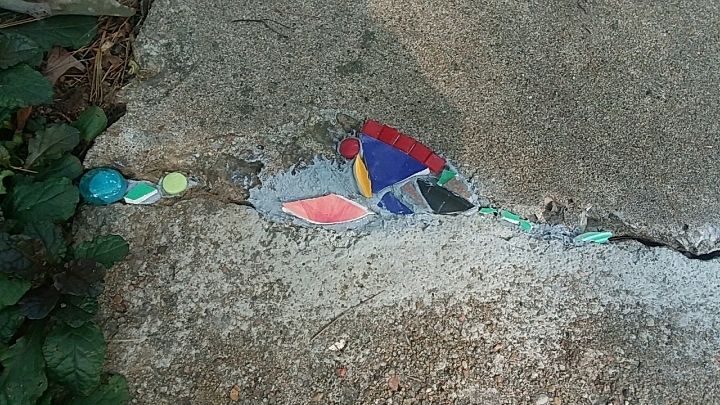 The sidewalk idea came from Pinterest, though I have done mosaic work a long time. 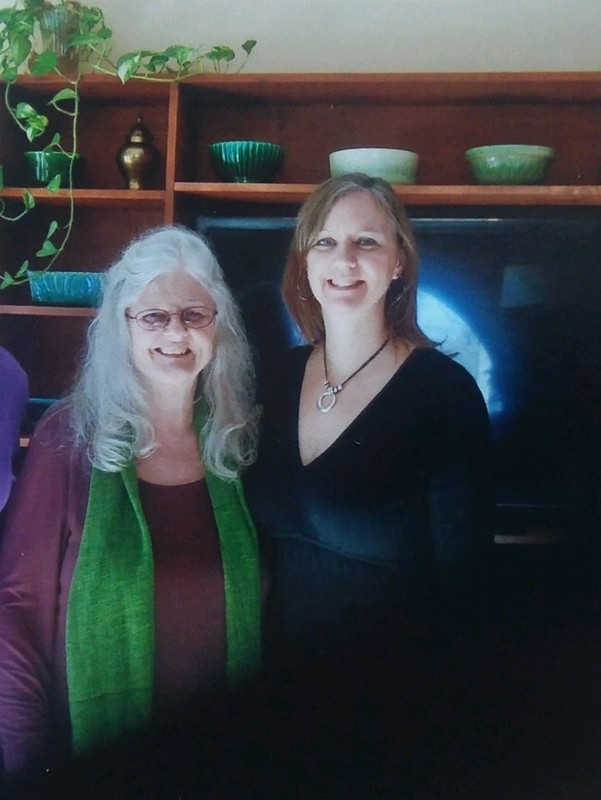 Great photos :) Is the one with both daughters in the 60s? I'm totally trying to see that vehicle off to the side there o_O Love older photos. 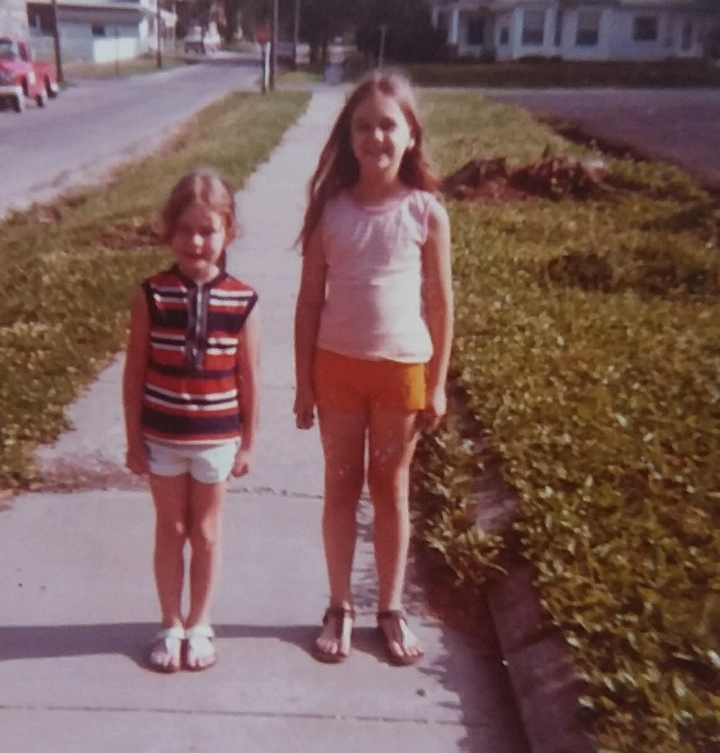 That photo would be early to mid 70's I think. What a great idea. I want to try that in my sidewalk cracks. Good luck on your drive to the city. You've got this. 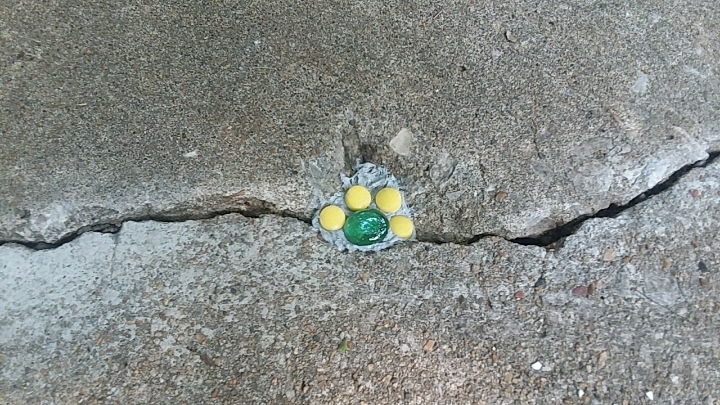 Oh, I'm loving what you are doing with your sidewalk cracks! I know what you mean about driving to the city after not doing it for a few years. But doing it again, will be an accomplishment. I fully understand that. Such a lovely photo of you and your daughter, too! A happy birthday to her! I am looking forward to the drive, husband offered but I decided lines. I will enjoybthe freedom and listening to my own music. Can't wait for some cooler weather to fill more cracks. I love the sidewalk mosaic. It brightens up an otherwise non-descript spot of ground that would normally just be overlooked by those who see it. I hope you got out of your therapy session whatever you were hoping for. As well, I hope you enjoyed seeing and listening to the band and celebrating your daughter’s birthday. Glad you like it, all encouragement appreciated. Though I won't go again, the therapy session validated my own thoughts and I am more comfortable in my head now. Truly listening to music and seeing old friends was more healing than paying to talk to a stranger. I think you are completely right about productivity! I want to make this a mantra of mine because I can slip so easily into laziness. It's been hard to get outside because I suffer from allergies and these days seem always to have a sinus headache. But I forced myself to go and weed the garden after a heavy rain when the weeds were easier to pull out and the rain helped tamped down the pollen. Your mosaic idea for the cracks is wonderful. It looks beautiful - a success! Good for you for venturing into the city and I hope you enjoy your daughter's birthday outing! I finally got some weeding done this morning. That is hard work and I have to get out early before it gets too hot. I'd like to work on the cracks some more but that will have to wait for cooler days. I was awfully tired after driving to the city, but went to my daughters party because I knew it was important to her and did enjoy it.